Sounds really gross, and unless you’ve been avoiding the internet for the past year or so you’ve probably heard this term. For sure you’ve heard of probiotics since they’re unavoidable in the grocery aisles. But if you only get your understanding of them from the yogurt commercials, you may be missing why these little microbes are so important to us! Western medicine and the “SAD” Standard American Diet have created a mess of our ‘health’. Doctors treat the symptoms of illness in isolation, and our food has been processed so as to minimize original nutritive value (only to then fortify back vitamins). I’ll admit, I buy orange juice with added vitamins because I doubt we get enough calcium with our lactose sensitive family. 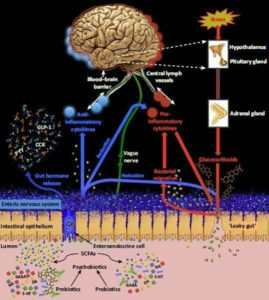 It makes sense that lifelong serotonin issues (ex .migraines, depression, IBS) have their root in the gut and they should benefit from some probiotics, nutritional adjustments, and gut healing. Serotonin balance is also improved with exercise and mindfulness practices (meditation, prayer, breathing, and yoga to name a few). We would do well to do all of these healthy things! There are a ton of articles out there now about this, but before you spend a million bucks on supplements make sure you talk to a whole-body informed doctor- possibly a DO or one trained in functional health. I incorporate whole body wellness into my counseling practice, making sure I talk to clients about their physical health, checkups, nutrition, sleep and exercise. It makes a difference to your brain when your body is suffering! They can’t be separated and we’re just getting a glimpse of how our gut is our ‘2nd brain’.